Maintaining water flow through culverts and pumping stations is essential to efficient water management. Trash screens and the equipment designed to keep them clear of debris perform a vital role in flood prevention. ECS has considerable experience in designing, fabricating and installing complete trash screen solutions including automated clearance systems and the integration of the associated controls with the existing equipment. For information about specifying Weed and Trash Screen, please find our article here. Trash screens form a crucial part of the infrastructure designed to reduce the risk of flooding in waterways and water processing sites. Where a watercourse flows through a culvert there is an increased risk of blockage, requiring careful design consideration to ensure the most efficient structure is installed. A culvert represents a bottle-neck in a watercourse and often the installation of a trash screen will help to alleviate blockages, but the screen can also present a flood risk itself if it is not properly maintained and cleared regularly. The amount and type of debris that is captured by the screen is dependent upon the time of year and the location of the screen. These factors all have a bearing on the amount and type of debris that is deposited in the watercourse and therefore they also affect the risk of blockage and subsequent flooding. Once the decision to install a screen has been made, proper design of the screen is essential in order to prevent it becoming a flood risk in itself. This design should include careful consideration for the bar spacing, screen angle and distance from the culvert entrance in addition to the clearance method and frequency. Information gained about the location helps to determine the type and size of debris likely to accumulate at the screen and as the ratio of debris length to bar spacing increases, so does the risk of blockage. The angle at which the screen is installed also affects the efficiency, with some screen bar angles in common use having been shown to block more frequently. Once the design of the screen is finalised, it is then necessary to assess the maintenance requirements of the screen. Many situations will be satisfied by manual clearing, in which case a safe platform needs to be included in the screen design. For situations where the amount of debris demands regular clearing or for locations where manual intervention is not appropriate, it is possible to install an automated trash clearing system, which can provide efficient and regular removal of the debris. There are a number of manufacturers and designs available, each with its own advantages, depending on the specific application. ECS can advise on the most appropriate model for your particular environment during the design and specification phase of the project. In applications where an automated system is being installed, the system can be triggered by a number of determining factors. Since the primary purpose of these structures is water level control, this can be detected and measured by ultrasonic devices and when the level differential either side of the screen reaches a certain point the clearing device can be started. If the trash screen is designed to help protect a pumping system, the clearing device can be triggered by the pumps coming on line to ensure that sufficient flow is permitted through the screen while the pumps are active. Finally, it may also be appropriate to have a timer to trigger the clearing system, especially if the watercourse has increased flows at specific times of day. Having decided on the design and the control specifications, the project solution then requires manufacture and installation, all of which needs expert engineering capabilities as well as experienced on-site engineers and divers who can complete both the civil engineering requirements as well as the mechanical and electrical engineering. ECS Engineering Services has a dedicated Water Control engineering division, with over 20 years’ experience in delivering turnkey projects for a wide range of clients including the Environment Agency, Water Utilities and Internal Drainage Boards. 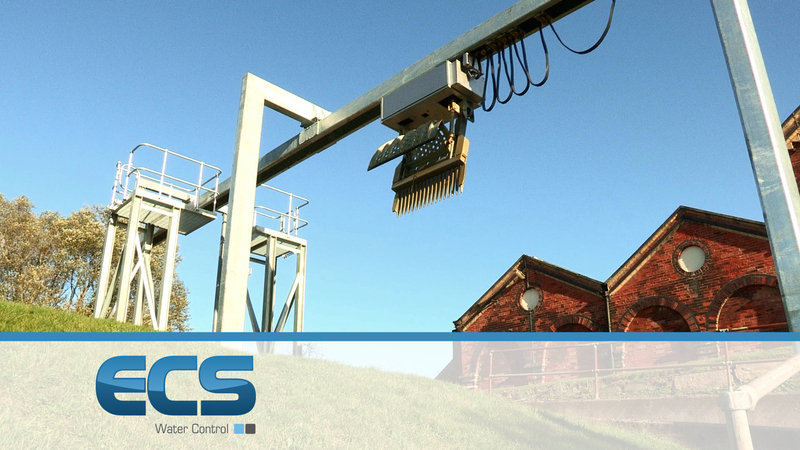 ECS Water Control offer a full turn-key solution for Landustrie automatic weedscreen cleaners which includes the removal of the obsolete equipment, additional civil engineering to prepare the site, complete mechanical and electrical installation as well as testing and commissioning. The automated system performs a cleaning cycle each time it is triggered, which can linked to the operations of pumps, on a timer or based on a water level differential measured by ultrasonic sensors. It can also be operated manually using a plug-in, hand held console. This choice of operation makes the cleaning system very adaptable and suitable for a variety of applications. The cleaning cycle involves the grab moving from its parked position to a point above the weedscreen where it is lowered onto the screen to a point below the surface of the water. The grab is then closed hydraulically and raised out of the water before traversing along the gantry to a point above the skip, where the weed is deposited. This procedure is repeated until the full width of the screen is cleared. Landustrie automated weedscreen installations can be connected to local telemetry systems to provide feedback on the current operational status as well as a requirement for any operator intervention. The cleaning system can also be operated locally by hand with the push-button pendant which is plugged into the system at a point close to the screen to allow the operator a clear and safe view of the operation. The system is built to provide reliable operation, with a minimum of components to simplify the maintenance requirements.